If you had access to the stadiums, huddles, locker rooms, press conferences, prayer circles, and private conversations of professional football, what you found there might surprise you. 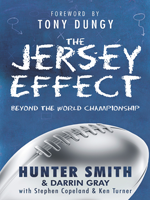 Hunter Smith, twelve-year NFL punter and Super Bowl XLI Champion, partners with Darrin Gray of All-Pro Dad, a national fatherhood program, to write The Jersey Effect. Seeking to help athletes, parents, and coaches gain a proper perspective on sports, they use real-life examples and biblical principles to address negative cultural trends and illuminate the truth and lies in athletics. Fame and fortune can hijack even the most well-intentioned players, feeding them subtle lies that football is a god. The Jersey Effect takes a look into the hearts and minds of athletes who achieved Super Bowl success and examines the battles they faced. It presents the stories of champions who desired to reflect glory back to God by using their “jersey” and the platform God had given them to make a positive difference in the world. Even so, sometimes their great intentions were hijacked by pride, materialism, distractions, and deficiencies within their own character that were never truly understood until the ultimate success had come their way. Intended for players, coaches, and parents that want to learn and in turn teach important lessons about how to properly align their love of sports with God’s heart, The Jersey Effect advocates for a full 360 degrees of influence: coach on player, player on coach, player on parents, parents on player, and team on community. The Jersey Effect demonstrates how to pursue the ultimate prize—a goal that has little to do with winning a championship ring and everything to do with how we can have a positive effect on those around us through the sports we love.